Family Health News is promoting its Burn Clean for Well Being regimen, a program that helps maintain the body through cleansing and detoxification of the blood and major organs, to Human Resources departments across the U.S., with a 15 percent discount to employees when they sign up through their employers. The Total Oxygen Cleanse stage consists of Colosan and Hepasan. 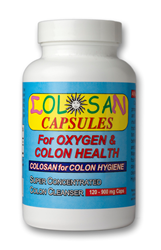 Colosan uses oxygen to cleanse your intestines and colon, and Hepasan is a liver, kidney and gall bladder flush. The Burn Clean for Well Being regimen is easy to follow and guaranteed to move toxins and food through the body quicker. This equates to weight loss, feeling more alert and an overall improved mood. What more can an HR department want from employees than improved health and mood? Burn Clean for Well Being has four steps, which are completed sequentially as a base regimen: 1. Total Oxygen Cleanse; 2. Run Clean; 3. Square One; 4. Filter, Factory and Warehouse. There is a related program guide containing 14 tracks, providing an explanation of each supplement alongside diet and lifestyle change recommendations. “Removing toxins from the bloodstream and organs will elevate your mood,” Family Health News editor John Taggart said. “The Burn Clean for Well Being regimen is easy to follow and guaranteed to move toxins and food through the body quicker. This equates to weight loss, feeling more alert and an overall improved mood. What more can an HR department want from employees than improved health and mood? Family Health News produces a magalog of alternative health and complementary medicine product reviews, reviewing more than 5,000 supplements over the past 28 years. Family Health News refined this list of thousands of supplements to the top-rated products in various categories, amounting to more than 75 products in its sale catalogue. Family Health News products include: Colosan Capsules for Oxygen & Colon Health, Colosan Powder for Colon Hygiene, Food Grade 8% Hydrogen Peroxide, HEPSAN Liver Cleanse, Osteo Pro-D Bone Health Cream, Oxy Max Colloidal Silver & Stabilized Oxygen, Prominzyme Digestive Aid, Thinner G - Synergy for a Thinner Me, Vital O Daily Oxygen, Enzyme & Mineral Supplement. Each product is eligible for a 15 percent discount when signed up for through an employer. For more information on Family Health News and its products, visit http://www.familyhealthnews.com. To learn more about Family Health News’ “Burn Clean for Well Being” program for overall health, visit http://www.burncleanforwellbeing.com. HR Departments looking to receive a 15 percent discount on Family Health News items for employees should fill out this form, http://burncleanforwellbeing.com/contact.